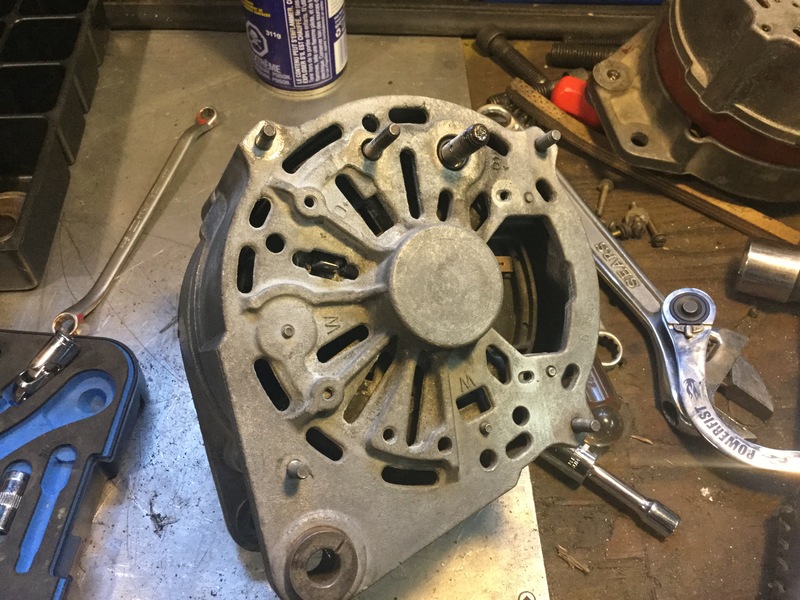 Back in January I had to do an emergency bearing replacement on the old wbx alternator. The local NAPA store had the bearings in stock (no name bearings, sigh) and the job went fast and worked. While I had the alternator apart I cleaned up the commutator but I noticed the copper was getting very thin and probably wouldn’t last much longer. 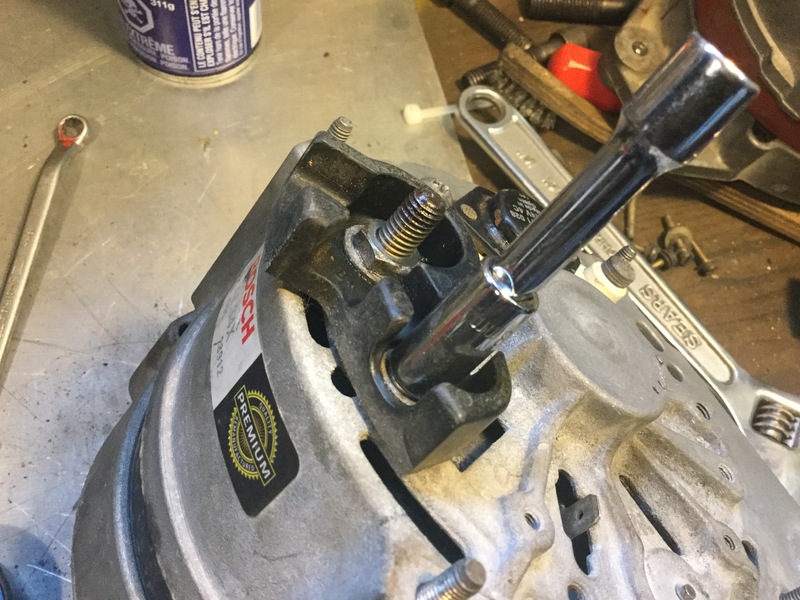 I don’t know how to replace the commutator, or even if it’s possible to do that at home. 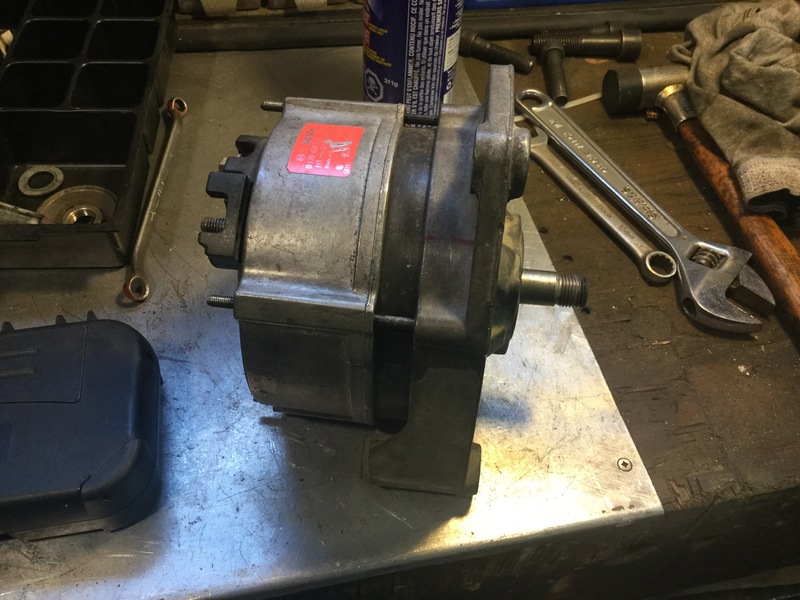 Yesterday when I picked up the Passat gauge clusters at the wrecker yard I also grabbed a Bosch al34x alternator ( also from a Passat), suffering from a brain fart thinking it was a direct swap into the wbx. Of course it ain’t, the bodies are different. 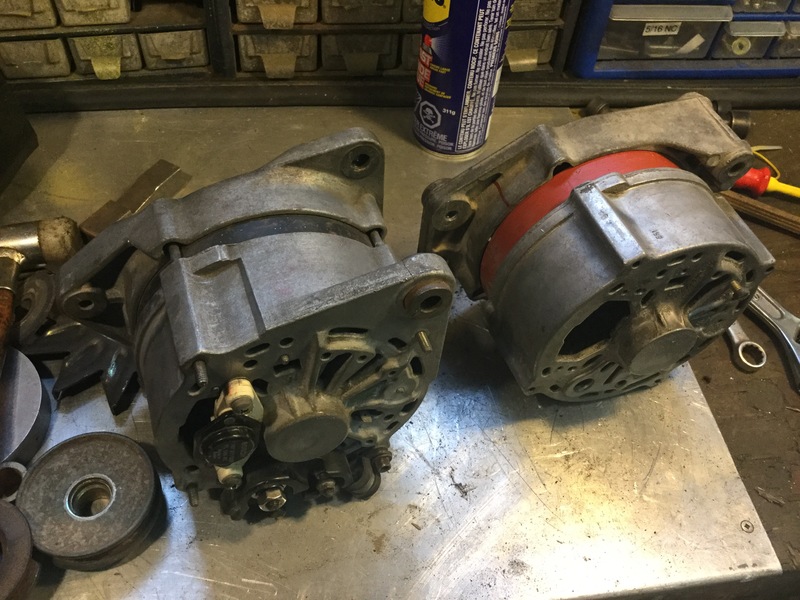 The al34x is on the left, a broken ( severed wires from stator to diode pack )a parts wbx alternator on the right. Note the different mounting. 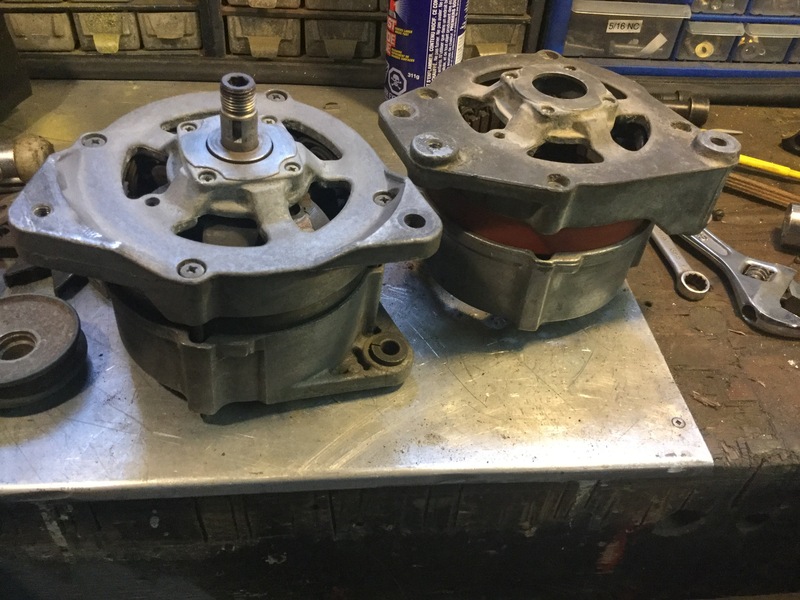 So today I tore the al34x apart and mounted its rotor, bearings, diode pack, and stator into the wbx housing. 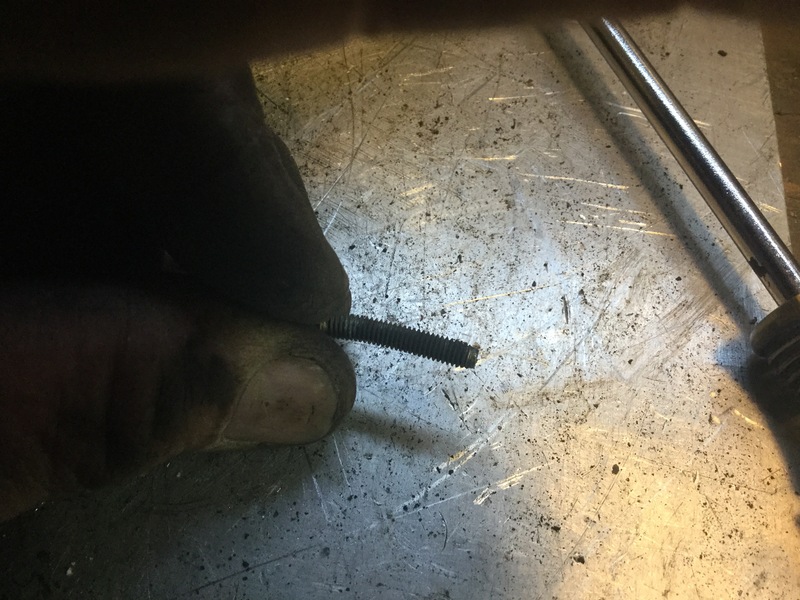 The biggest chore when working on alternators is the fekkin hard to loosen machine screws. The long ones that hold the body together and the short ones on the bearing retainer plate and the diode pack. I’ve seen both slot and Phillips head in these, either way you have to use all your guile to get them loose. First the brush pack get pulled (you all know how to do that ) then the plastic on under the b+ and the “blue wire” (damn I forget the number designation ) terminal. The handy 1/4″ drive tool shown, I’ll talk about more later. And the pic shows that the alternator was a “premium ” rebuild. Premium, ha! 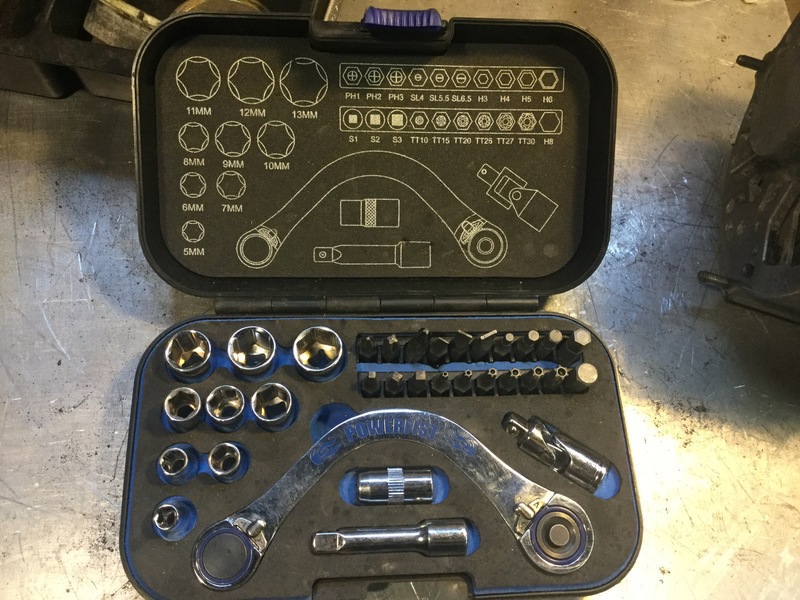 The 1/4″ drive tool set I’m using has screwdriver bits. And even being a cheap set the bit was up to the task of removing the long machine screws holding the housing together. That is after I used a regular screwedriver and hammer to give each machine screw a good rap. 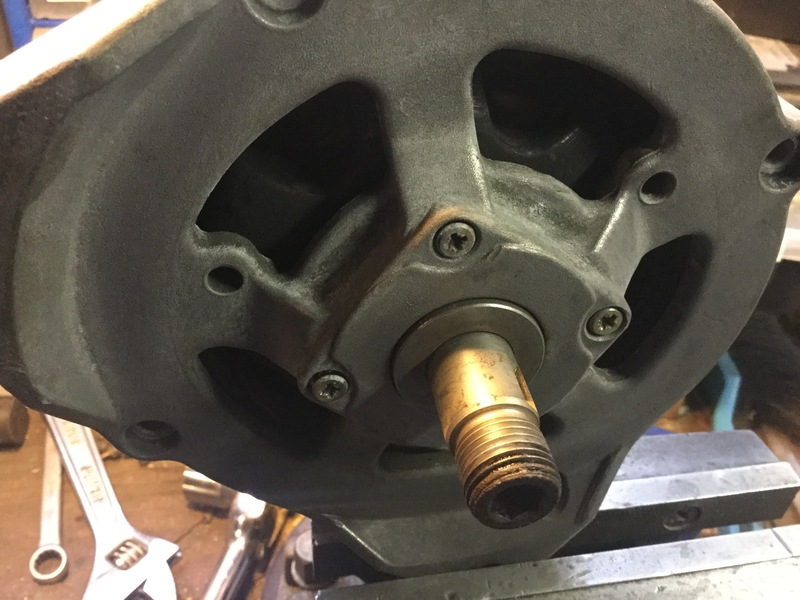 Then same rapping and grunt to remove screws from bearing retainer plate ( plate is internal but you have to remove the four screws before you can get housing apart). After all that and some love with the soft hammer, the housing comes apart. Then you pull the rotor out. 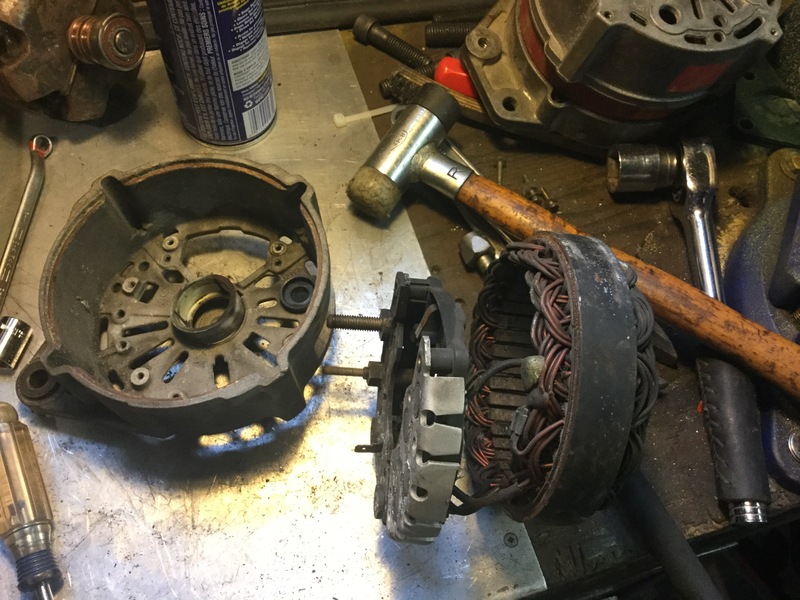 Well it looks like I struck out hoping that the commutator would be relatively fresh. It’s not, it’s more worn than I hoped. But that’s not the surprise mentioned in the blog post title. 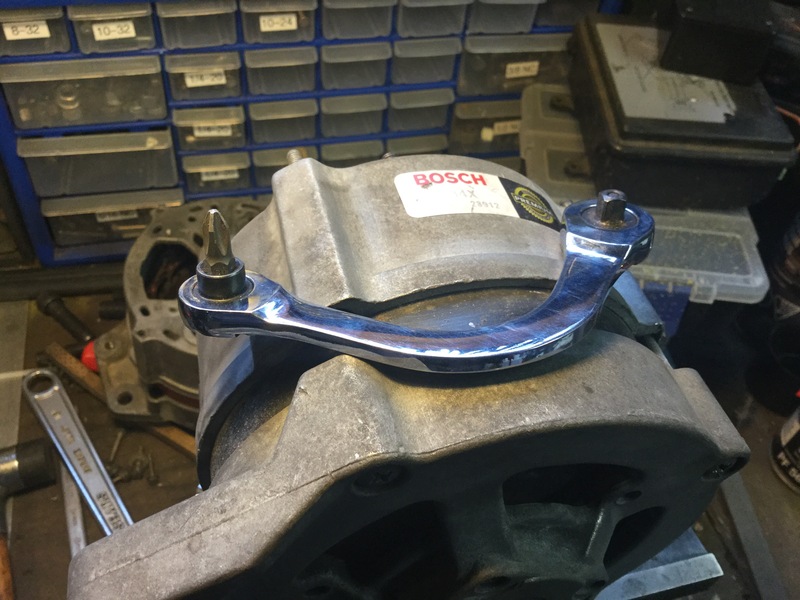 Remember this is a Bosch “premium” reman. See it? The machine screw? It’s supposed to be in the hole just down and to the left, in the diode plate. I mean really, it came loose? 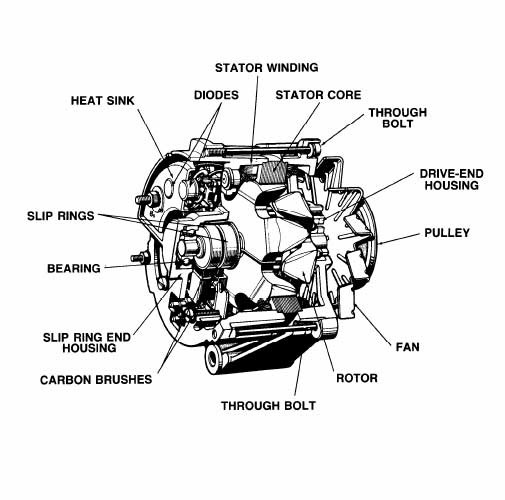 Does this alternator actually work with that screw up there doing who knows what sort of mechanical and electrical mischief? Well I’m in so deep, time and money, so I might as well finish things. The rest of the diode pack screws were not easy to remove. Too late I’m telling them, you can’t make up for your weak buddy. 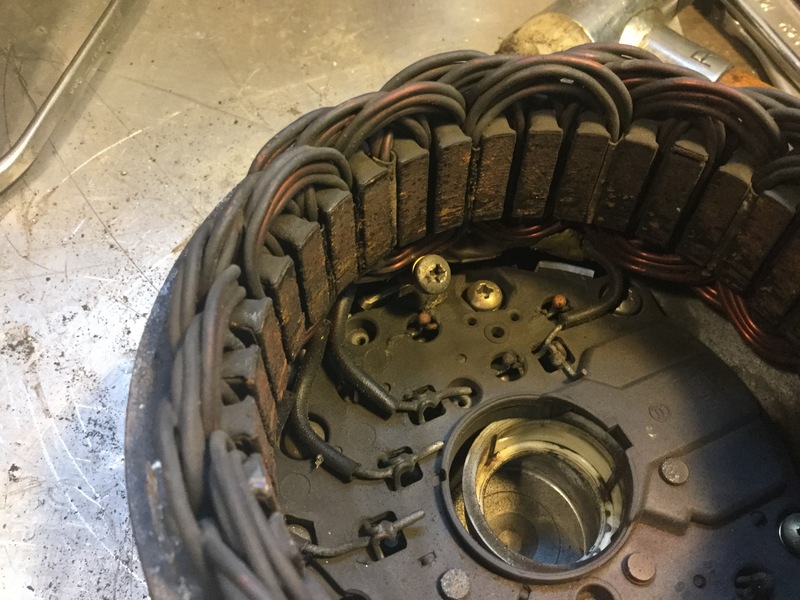 You can move the stator around a bit, careful not to stress the copper wires, to get at the screws. Then pull the diode pack and stator out of that housing and pop it into the wbx housing. If you’ve made it this far you’ll know that putting it all back together is just the reverse 🙂 just keep an eye on the alignment of the two parts of the housing. And there we are, guts swapped. Maybe it works but too late in the day now to test it. Man, I can’t get over that loose screw. 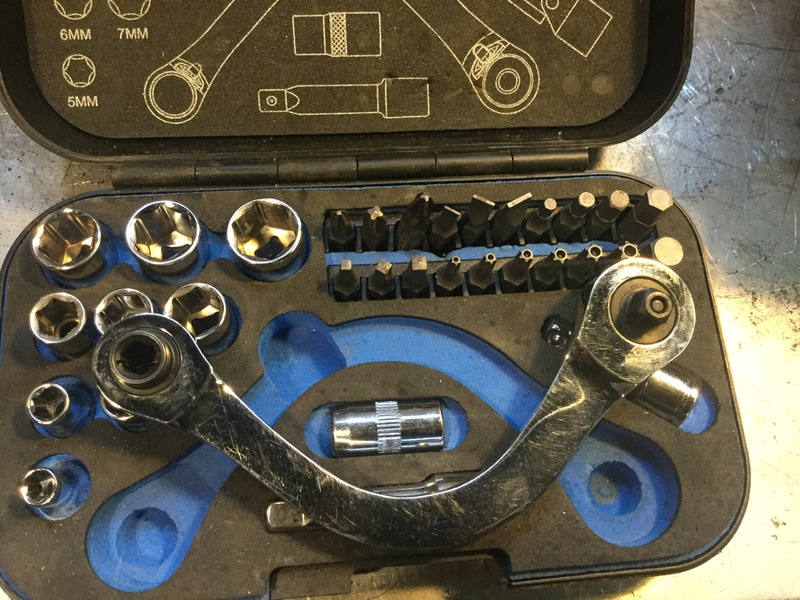 Hey, the 1/4″ drive tool I used a lot on this job is a cheapo set I bought a couple of years ago at Princess Auto. If you’re Canadian you know what that store is. I found it on sale, I think under 20 bucks and I have to say I really like it. It’s actually very well made, the ratchet could be finer of course, but jeepers for the money it’s great. This entry was posted on March 5, 2017, 5:21 pm and is filed under vanagon, vanagon mods. You can follow any responses to this entry through RSS 2.0. You can skip to the end and leave a response. Pinging is currently not allowed. Impressed. I hope it works! I hope so too. It spins nicely, but then again it spun nicely with the loose screw in it. Alister, Always a treat to see what your up to simplifying and demystifying the whole process. Paul. It’s arguable if doing this kind of thing at home is really worth it. 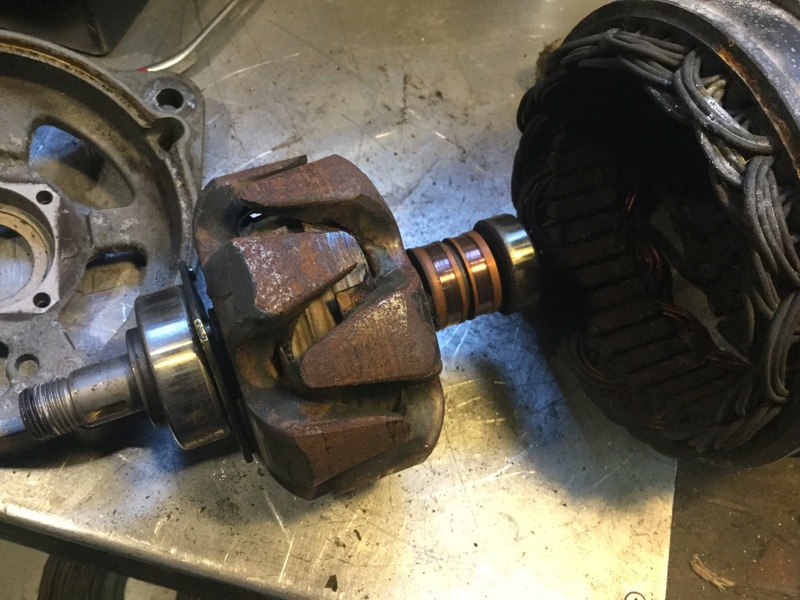 I will argue that a bearing replacement is worthwhile, but commutator I’m not sure. And does the varnish insulation on the windings break down over time? Well there you go! Thanks for that. It’s a plastic body with the copper bands pressed on, well that’s what it looks like on the alternators I have. And the wires…. soldered to the slip rings? I’m going to pull apart a rotor and find out. I have a rotor with completely worn out copper. 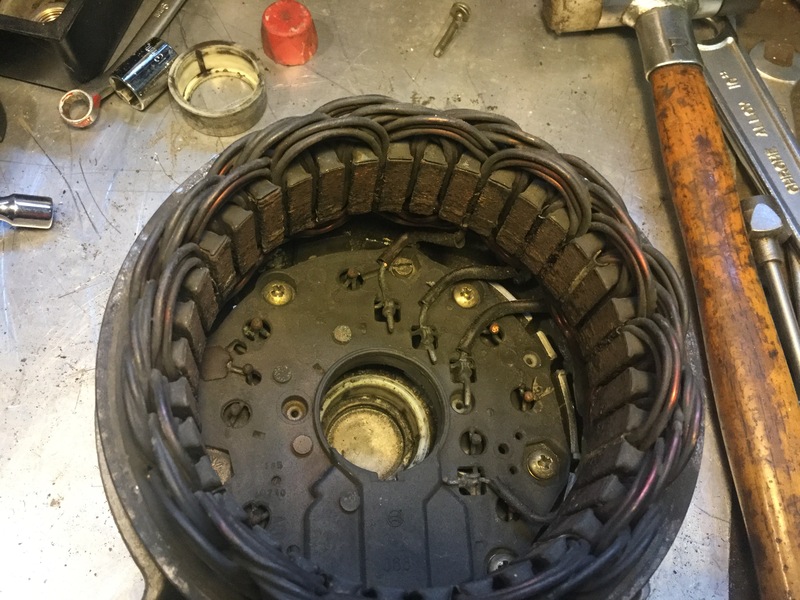 Not our type of alternator but I think the technique the same. Just as well you had to change cases, the foot on the Passat one is cracked. 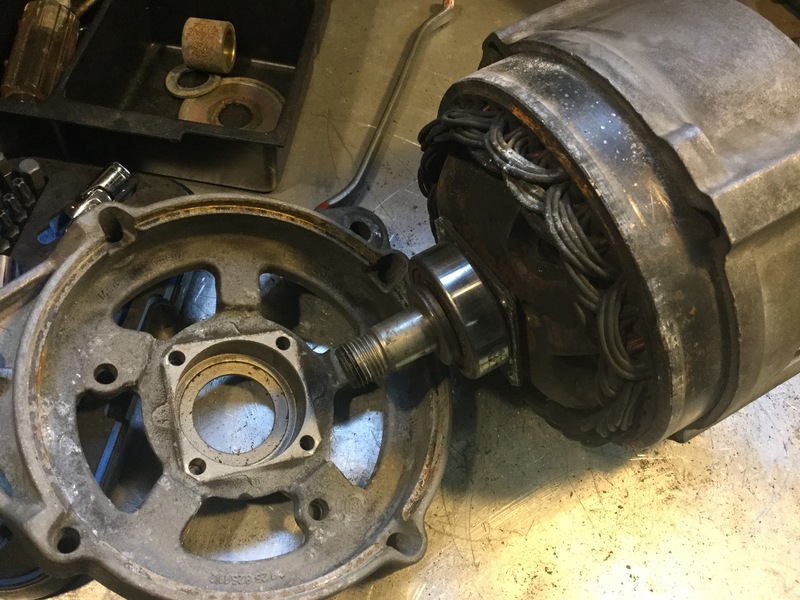 Well, Alistair sure went the distance to fix this one..
Electrical stuff has become a challenge keeping these vehicles on the road in reliable condition..